Yesterday was the big day... the results of my scans. I have to give myself a high five for keeping my nerves in check all day. It must be noted that I get nervous to walk into a doctor's office to pick up a prescription at the front counter... doctor's office freak me out. Full of sick people... full of germs... full of bad news. I want to thank my work for putting off moving our computers forward where I had to do a whole years worth of fixed assets update in one day. Keeping your mind busy helps with nerves. I'll remember that. I get to the doctor & I literally can't even sit down in the waiting room. Why? 3. Hey, let's get those FitBit step count up by pacing. WHAT? My heart is leaping. No... no one called & told me... is this really surprising with the way this doctor's office has worked so far? My eyes were the size of half dollars & I finally said, "Don't tell me OH ... Wait a second... & then not tell me what you are looking at or for!!!" She laughed & said, "Oh no honey - everything is fine. I'm just looking at measurements of your organs." & wouldn't words other then "Oh... wait a second" have been more appropriate. The doctor came in & told me that everything looked perfect. Not even a sign of a fatty liver which is common for someone my age, & with someone my weight (shut up)... hey, at least I have a skinny persons liver. HA! I always say I have small wrists. Now I'll add I have a skinny liver to that. But my pancreas looked great, my kidneys look perfect, & even the arteritis flowing to it all are flowing perfectly - no blockages anywhere. & then she told me they had actually checked for bone cancer as well - she told me that was her fear with this pain & the worst case scenario. SAY WHAT?!?!? Bone cancer? ... We just watched our dog suffer for 8 months with bone cancer. All I can say is THANK YOU JESUS I didn't even know she was checking for that. I wouldn't have even been able to function with that news. The down side....She put me on the table & pressed on my side & mercy, goodness gracious, give me strength, dear Lord... the PAIN!!!! Still as fresh as the first day. It literally brought tears to my eyes. She told me that we have now checked all the internal organs so she doesn't feel like its anything serious. She then felt my back muscles & said that it feels like the muscles on that side of my back are sticking out further then the other side... & she said she honestly feels like my body is out of alignment. Especially my ribs. Somehow twisted. & if they are pulling out of alignment, she said those muscles that are connected - those intercostal muscles - are being pulled the wrong direction, laying on nerves & bone in the wrong direction. She said that would explain why none of the strong anti-inflammatory medicine hasn't helped at all. So, she's sending me to a chiropractor. I will say, that's why I love going to a DO instead of a MD. They think more 'alternative' & out of the box - not more of the path of medicine & surgery. She did say that if none of the adjustments work in a few months with that, then we'll do an MRI & then maybe we will have to see if something needs to be surgically adjusted .... let's not even think of that path. I'm putting hope in the idea that adjustments are going to work. I'm just so thrilled that nothing internal is going on. I was so fearful. But I walked back into the office after work with my hands in the air & said to my co-worker, "I'M GOING TO LIVE"... that's how I felt all day yesterday... & today... & I'm sure tomorrow. I'm going to live with pain apparently... but I'm going to live. I mentioned yesterday on Instagram that I'm really going to try to learn what God is telling me or showing me about this pain. He always has a lesson in everything... He REALLY must be trying to make a point with me & this. The pain is 2 months old on Sunday (geez) ... but as long as its nothing serious, I can learn to live with pain. Don't we all do that anyways. & I seriously want to thank so many of you all for the texts, messages, emails... the sweet words of assurance & prayers & good vibes. I loved opening up my inbox & seeing words that were telling me that "I know its going to be fine"... "Have faith about it all"... "God has got this".... I am surrounded by so many amazing people. People that I know are faithful in prayer & abounding in encouragement. I have been blessed. I could have written most of this myself ... maybe you're my twin, separated at birth? Ha! Great news! 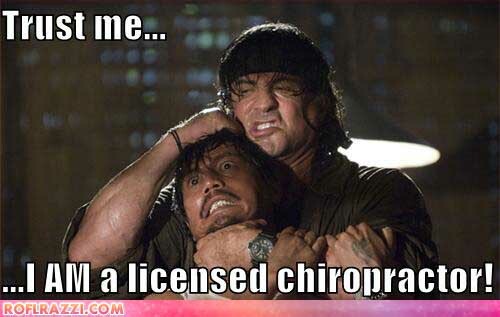 I hope the chiropractor can help and you don't have to live with the pain too much longer. hooray!!! i know you had a big sigh of relief!! I'm glad all your scans came back clean! YAY! yay!!! such good news girly, and i really hope going to a chiro helps you out!! Hallelujah! What great news. I love and totally believe in chiropractors. Here's to hoping you'll be pain free before too much longer. Hooray! Glad the scan showed everything to be ok - praying the chiropractor will help alleviate the pain :) happy Friday!! So happy to hear it's nothing serious! An alignment can do so many wonderful things for your body. I never knew just how connected everything was. I'm with you though, had I heard the word cancer, I would have just shut down. Great news!! A chiropractor will take time BUT WORKS!!! Eric and I go monthly if not more and I've taken my girls since they were 6 WEEKS old. Yep BIG believer. And with you running and exercising, you willbe amazed at the results. Hope you get relief soon!! I'm glad you got good news, but I'm kind of irked on your behalf that they couldn't have just called you to tell you everything was fine. I mean, it's probably good that you got the suggestion for a chiro, and hopefully that'll work, but you could have shaved hours of stress off if they'd just looked at the results when they got them and called you. That is great news! I pray that seeing a chiropractor will solve all your issues and your pain will go away. So thankful!!! Hope the chiropractor helps! Wonderful news - so glad everything came back clear!!!! Yay! So glad your test came back find what's negative, and I hope that they find what's causing your pain soon! I remember when I was single and in college, I had gotten an HIV test. When I went to the doctor to get the results, she said, "Your results are negative.... well, wait.... yes, I guess your results are negative." What the what??? You can't be more definitive than that? Crazy doctors! I LOVE my chiropractor...it's amazing what they can do! So happy to hear you are not going to die quite yet! Hey this post made me remember...at one point in life about 4 years ago, I was having breathing difficulty and was so worried...My doc immediately felt the alignment of my back, It was cockeyed ? Cracked my back once and I set up to take a full pain free breath. It was amazing! So, for some reason, all of your posts just appeared on my reader all together (hence the comment spamming haha), so I just saw this and am so happy for you that it's not something like cancer. I'm sorry you're still in pain, but hopefully it'll get better soon!